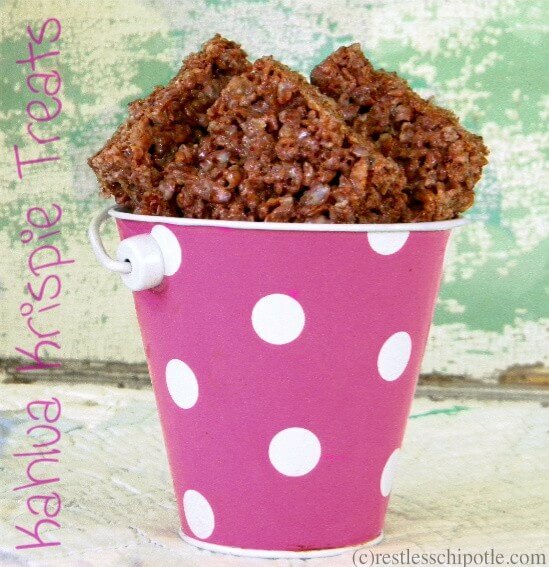 Kahlua and Chocolate Krispie Treats are a no-bake, quick, and easy snack for anytime! Rich chocolate and coffee flavors combine with the gooey marshmallow and crispy cereal in a way that reminds you of your childhood favorite… but this one is just for the adults! There are those things that we adore in childhood and then leave behind as we grow and mature. I would guess that most of us don’t play hopscotch anymore and Kool-Aid isn’t really on my 5 p.m. priority list. But Krispie Treats? Now those, THOSE are different. They are as much a part of my life now as they were in 1965. More so because now I have the freedom to make two pans and hide one pan for myself. Don’t looks so shocked, you know we all do it. What’s not to like? Sweet, crispy, gooey, easy, fast, and cheap – they embody all that is perfect in a sweet snack food. Except one or two little things. Chocolate and booze. Well, now you can have both. Because, with all of the downsides of being an adult (no naps, you have to pay the bills) one of the benefits is you can choose to eat what you want. Anytime. Like these for … oh, I don’t know… breakfast. 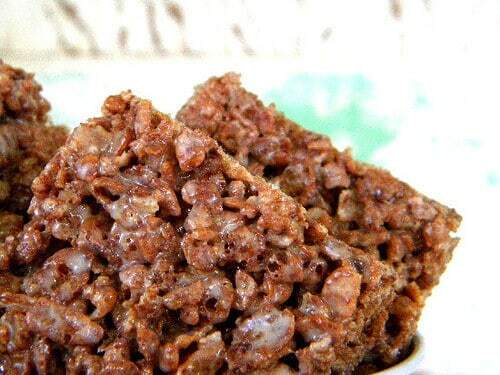 These chocolate and Kahlua krispie treats are addictive and rich, just as gooey as you remember but with the added luxury of chocolate and Kahlua. They go together just as quickly as the original but the result is so, so, SO good. You can even press the mixture into a shallow baking sheet and cut them into shapes with cookie cutters when they are cool. So next time you are making a treat for the kids? Crisp, gooey cereal bars just like your remember but updated with Kahlua and chocolate. Melt the butter in a heavy saucepan. Add the marshmallows and stir until melted and smooth. Add the Kahlua and blend well. Stir in the cereal and the chocolate chips until well coated with the marshmallow mixture. What an awesome twist on a classic! Some days I miss eating sugar.